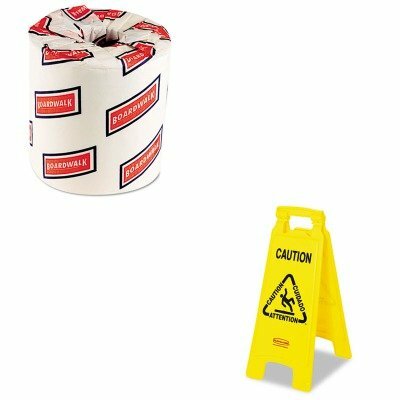 Rubbermaid Commercial FG611277YEL Floor Safety Sign, "Caution Wet Floor" Imprint, 2-Sided, Yellow. ANSI compliant multi-lingual graphics warn of nearby hazardous area. 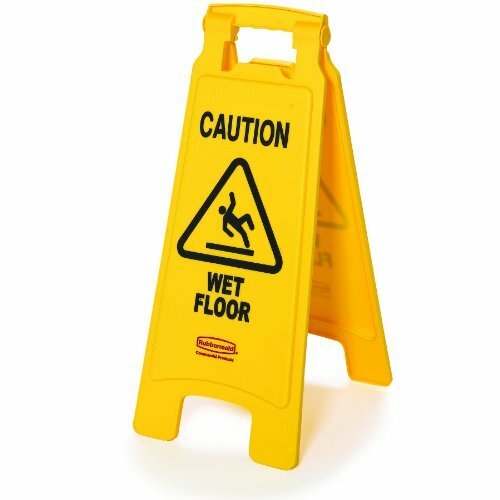 Economical, durable and easy to use caution sign. 2-sided narrow body allows non-obstructive placement in a variety of locations, including narrow areas and doorways. Lightweight and versatile; makes a heavy statement about safety. Folding design for convenient storage. 26.5 inches long by 9.5 inches wide by 1.917 inches high. 2.315 pounds. Made in the USA. ANSI compliant multi-lingual graphics warn of nearby hazardous area. bright yellow design meets OSHA requirements. Folding design for convenient storage or transport on Janitor Cart. Durable plastic construction will not rust, corrode or fade. Closed warning messages imprinted in English, French, Spanish, and German for effective communication to broad audiences. Narrow body and unique plastic arm allow non-obstructive placement in a variety of locations. Makes a strong statement about safety. 38 inches long by 12 inches wide by 37 inches high. 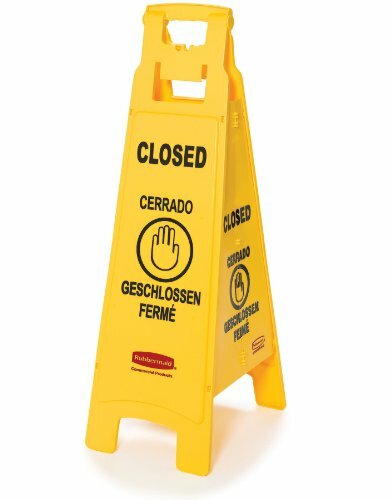 Rubbermaid Commercial FG611478YEL Floor Safety Sign, "Closed", 4-Sided, Yellow. 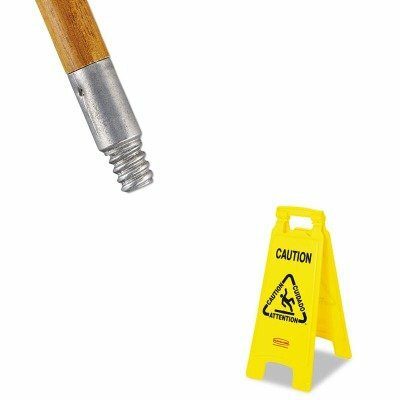 Rubbermaid Commercial FG9S0725YEL Folding Safety Cone with International Wet Floor Symbol, Yellow . The folding safety cone folds with a twist to fit into a compact storage shell. It is ideal for airports, amusement parks, and public bathrooms. It has 30 percent more surface area than competitive fabric safety cones and is highly visible. Storage shell mounting hardware includes tape, strap and screws. 1.567 inches long by 0.925 inches wide by 0.825 inches high. 1.373 pounds. Imported. 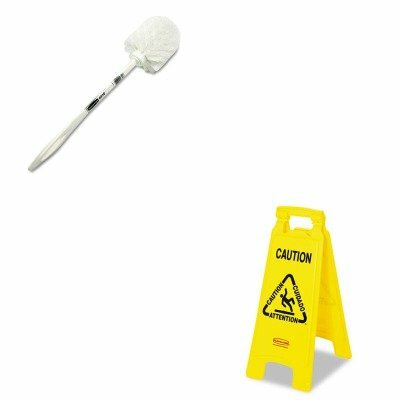 lt;stronggt;RCP3486108lt;/stronggt;lt;BR/gt;Light Commercial Spray Mop, 18quot; Frame, 52quot; Steel Handlelt;BR/gt;Light-duty product for professional home cleaners and small business owners. Dispenses liquid in two spray streams behind mop. Ergonomic thumb activated trigger. Includes 15 oz. refill cartridge. Application: Floors Mop Head Size: 18amp;quot; Wide Handle Length: 52amp;quot;.lt;BR/gt;lt;BR/gt;lt;stronggt;RCP611200YWlt;/stronggt;lt;BR/gt;Light Commercial Spray Mop, 18quot; Frame, 52quot; Steel Handlelt;BR/gt;Printed in English, Spanish and French. Folds flat for storage or transport on carts. Ideal for doorways and narrow spaces. Depicted Text: CautionAttentionCuidado Width: 11amp;quot; Depth: 1 1/2amp;quot;. 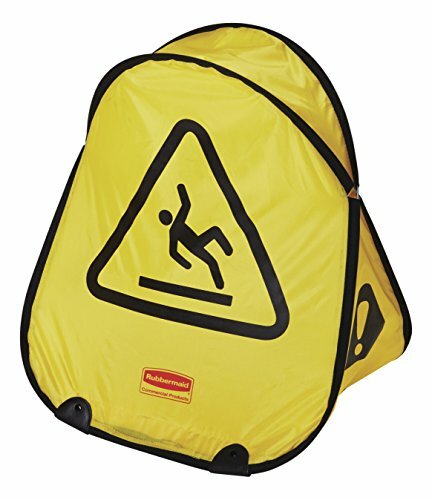 Rubbermaid Commercial FG611000YEL Hanging Safety Sign, Multi-Lingual "Caution" and Falling Person Symbol Imprint, 4-Sided, Yellow. ANSI compliant multi-lingual graphics warn of nearby hazardous area. 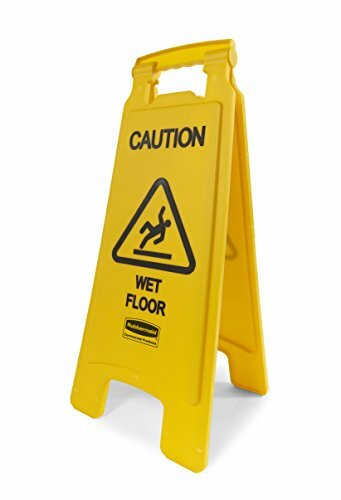 Economical, durable and easy to use caution sign. 2-sided narrow body allows non-obstructive placement in a variety of locations, including narrow areas and doorways. Lightweight and versatile; makes a heavy statement about safety. Folding design for convenient storage. 19.5 inches long by 4.375 inches wide by 2.5 inches high. 0.38 pounds. Made in the USA. lt;stronggt;RCP611200YWlt;/stronggt;lt;BR/gt;Rubbermaid-Yellow Folding Floor Signslt;BR/gt;Printed in English, Spanish and French. Folds flat for storage or transport on carts. Ideal for doorways and narrow spaces. Depicted Text: CautionAttentionCuidado Width: 11amp;quot; Depth: 1 1/2amp;quot;.lt;BR/gt;lt;BR/gt;lt;stronggt;RCPA21206WHIlt;/stronggt;lt;BR/gt;Rubbermaid-Yellow Folding Floor Signslt;BR/gt;Contains antimicrobial protection, which inhibits the growth of bacteria that causes odors and stains. Withstands repeated launderings without shrinkage, while looped ends and tailbanding reduce tangling for like-new performance after every wash. Colorfast fibers will not shrink or fade with repeated launderings. Pre-laundered and pre-shrunk for longer product life. PVC-coated mesh headband prohibits moisture penetration and resists chemicals. 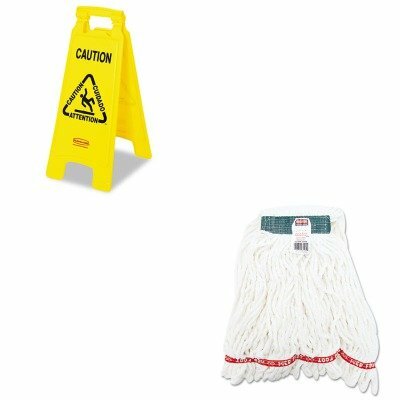 Head Type: Wet Mop Application: Floors Mop Head Style: Looped End Mop Head Size: Medium. Printed in English, Spanish and French. Folds flat for storage or transport on carts. Ideal for doorways and narrow spaces. Depicted Text: CautionAttentionCuidado Width: 11quot; Depth: 1 1/2quot;. lt;stronggt;RCP611200YWlt;/stronggt;lt;BR/gt;Rubbermaid-Yellow Folding Floor Signslt;BR/gt;Printed in English, Spanish and French. Folds flat for storage or transport on carts. Ideal for doorways and narrow spaces. Depicted Text: CautionAttentionCuidado Width: 11amp;quot; Depth: 1 1/2amp;quot;.lt;BR/gt;lt;BR/gt;lt;stronggt;RCP501188GRAlt;/stronggt;lt;BR/gt;Rubbermaid-Yellow Folding Floor Signslt;BR/gt;Strong, durable liners prevent tears, eliminate double-bagging. Star bottom prevents leaks. Excellent resistance to puncture and tearing. Recommended for sharper objects under tougher transport conditions. Perforated for easy tear-off and dispensing. Application: Can Liner; Capacity Range (Volume): 55 gal; Thickness: 2 mil. ~ Includes 100 can liners. 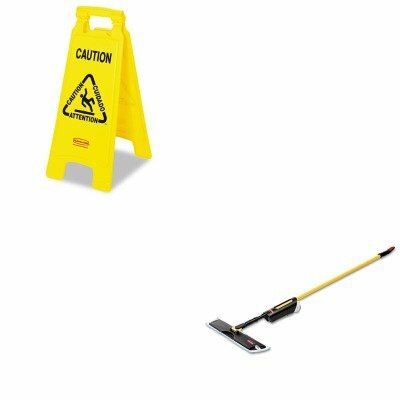 lt;stronggt;RCP611200YWlt;/stronggt;lt;BR/gt;Rubbermaid-Yellow Folding Floor Signslt;BR/gt;Printed in English, Spanish and French. Folds flat for storage or transport on carts. Ideal for doorways and narrow spaces. 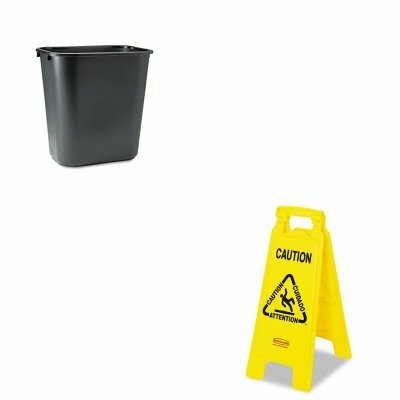 Depicted Text: CautionAttentionCuidado Width: 11amp;quot; Depth: 1 1/2amp;quot;.lt;BR/gt;lt;BR/gt;lt;stronggt;RCP295600BKlt;/stronggt;lt;BR/gt;Rubbermaid-Yellow Folding Floor Signslt;BR/gt;Lightweight containers are easy to handle and fit in well in many home and work environments. Rolled rims add durability and are a breeze to clean. All-plastic construction won't chip, rust or dent. Optional lids sold separately. Waste Receptacle Type: Wastebaskets Materials: Plastic Application: General Waste Capacity Volume: 7 gal. 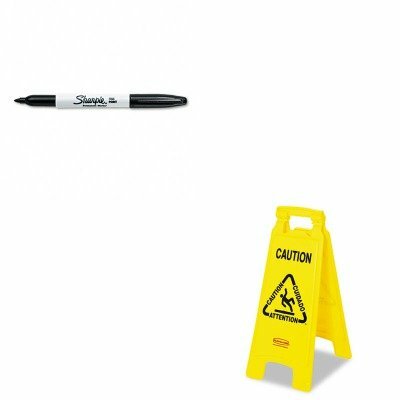 lt;stronggt;RCP611200YWlt;/stronggt;lt;BR/gt;Rubbermaid-Yellow Folding Floor Signslt;BR/gt;Printed in English, Spanish and French. Folds flat for storage or transport on carts. Ideal for doorways and narrow spaces. Depicted Text: CautionAttentionCuidado Width: 11amp;quot; Depth: 1 1/2amp;quot;.lt;BR/gt;lt;BR/gt;lt;stronggt;RCP631000WElt;/stronggt;lt;BR/gt;Rubbermaid-Yellow Folding Floor Signslt;BR/gt;Designed for easy toilet bowl cleaning. Plastic handle. Stain- and odor-resistant. Handle Length: 10amp;quot; Overall Length: 14 1/2amp;quot; Handle Material: Plastic. lt;stronggt;RCP611200YWlt;/stronggt;lt;BR/gt;Rubbermaid-Yellow Folding Floor Signslt;BR/gt;Printed in English, Spanish and French. Folds flat for storage or transport on carts. Ideal for doorways and narrow spaces. 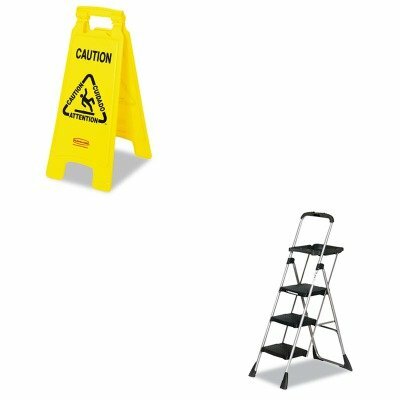 Depicted Text: CautionAttentionCuidado Width: 11amp;quot; Depth: 1 1/2amp;quot;.lt;BR/gt;lt;BR/gt;lt;stronggt;RCP6364lt;/stronggt;lt;BR/gt;Rubbermaid-Yellow Folding Floor Signslt;BR/gt;Strong shaft ensures durability. Threaded tip features a strip-resistant die cut. Standard sizing allows you to use nearly any common floor sweep. Handle Length: 60amp;quot; Handle Diameter: 1 5/8amp;quot;. lt;stronggt;RCP611200YWlt;/stronggt;lt;BR/gt;Rubbermaid-Yellow Folding Floor Signslt;BR/gt;Printed in English, Spanish and French. Folds flat for storage or transport on carts. Ideal for doorways and narrow spaces. Depicted Text: CautionAttentionCuidado Width: 11amp;quot; Depth: 1 1/2amp;quot;.lt;BR/gt;lt;BR/gt;lt;stronggt;CSC11880PBLW1lt;/stronggt;lt;BR/gt;Rubbermaid-Yellow Folding Floor Signslt;BR/gt;Lightweight yet durable steel work platform has three heavy-duty polypropylene resin steps with slip-resistant treads and a large 14 3/4w x 12d top platform step. Handy molded utility tray holds tools, paint cans and wallpaper rolls. Extended hand-grip handle with tool holder. With non-marring, skid-resistant feet to provide stability and protect floor surfaces and easy one-hand fold and lock release. Select ladder of proper duty rating to support combined weight of user and materials. Materials: Steel Colors: Black Number of Steps: 3.
lt;stronggt;RCP611200YWlt;/stronggt;lt;BR/gt;Rubbermaid-Yellow Folding Floor Signslt;BR/gt;Printed in English, Spanish and French. Folds flat for storage or transport on carts. Ideal for doorways and narrow spaces. Depicted Text: CautionAttentionCuidado Width: 11amp;quot; Depth: 1 1/2amp;quot;.lt;BR/gt;lt;BR/gt;lt;stronggt;SAN30001lt;/stronggt;lt;BR/gt;Rubbermaid-Yellow Folding Floor Signslt;BR/gt;This fine tip permanent marker is the original Sharpie. Permanent on most hard-to-mark surfaces. Quick-drying ink is waterproof, smearproof and fade-resistant. Marker Type: Permanent Assortment: N/A Colors: Black Tip Type: Fine. 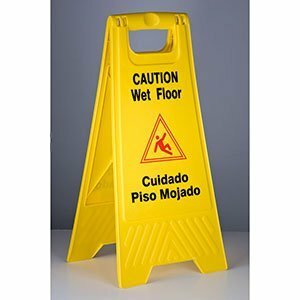 lt;stronggt;RCP611200YWlt;/stronggt;lt;BR/gt;Rubbermaid-Yellow Folding Floor Signslt;BR/gt;Printed in English, Spanish and French. Folds flat for storage or transport on carts. Ideal for doorways and narrow spaces. 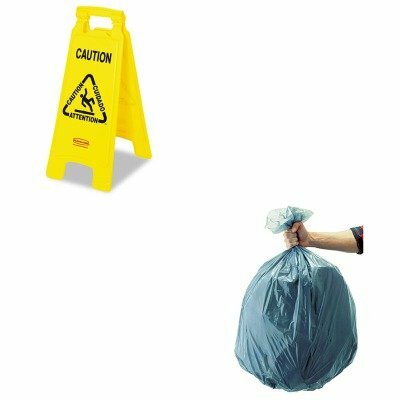 Depicted Text: CautionAttentionCuidado Width: 11amp;quot; Depth: 1 1/2amp;quot;.lt;BR/gt;lt;BR/gt;lt;stronggt;BWK6180lt;/stronggt;lt;BR/gt;Rubbermaid-Yellow Folding Floor Signslt;BR/gt;The economical choice for quality bathroom tissue. Embossed, standard size roll. Tissue Type: Toilet Number of Plies: 2 Number of Sheets: 500 per roll.